And now, at last, the most important woman in the history of television journalism gives us that "whole package," in her inspiring and riveting memoir. After more than 40 years of interviewing celebrities of all kinds, Barbara Walters has turned her gift for examination onto herself to reveal the forces that shaped her extraordinary life. This book introduces you to the world of journalism for the past 50+ years. Barbara Walters' account is honest, engaging and inspiring at the same time. She gives you inside information about many of the people she has interviewed over the past 4 decades and you get to see them in a different light. Without realizing it, you also learn a great deal about recent history. Most importantly, she is a facinating figure and if like me, you've wondered about who she really is, she covers everything in this book. It reads like a good and thorough conversation--you feel as if she is seated on a sofa in your living room and, at your request, is telling you her life story. The Narrator does an incredible job in bringing her to life. 26 hours seems like a very long book, but actually the length of this book is one of the reasons that I picked it. I was looking for a great memoir of a great person. Someone that would inspire and entertain me.I also wanted to get my moneys worth. I have never been a Barbara Walters fan, but I am now. I don't agree with a lot of her politics, but that is beside the point. This book is like sitting beside her as she is talking to her best friend. Its so candid and unscripted. I feel as though she has given me so much information (carte blanch) that I understand her and others who are like minded to her in a much fuller, richer way. I have only finished one quarter of this book to date. I wil update this review as I get further into the memoir. If you are the kind of person who people watches and pays attention to little details of a persons mannerisms and personality and listens to a persons history in order to get information about who they are and how they became this way, then this book will not disappoint you.If you want to get to the meat and potatoes without all of the back story and history, then move on to a different memoir.By the way I have never reviewed a book before so I hope this helps you. An engaging and amazing read! I haven't finished listening, but am about three quarters through and cannot stop recommending this book to family and friends! 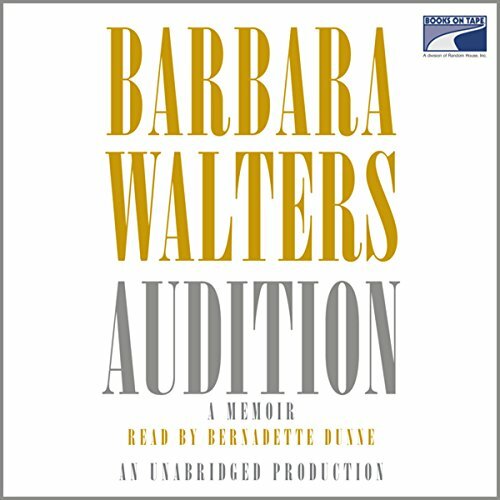 It's a wonderfully touching and candid memoir, written by a celebrity I didn't really appreciate; as a young Australian, although I know who Barbara Walters is, I'd never understood or appreciated just why she was so famous as a professional television journalist. This book has certainly set me straight!! Without doubt, this is one of the best memoirs I've read and definitely the best book I've read in the past year or so. Barbara's conversational writing style is very engaging and her recollections of interviews, news stories and scoops, along with amazing inside and background information, as well as the political/historical context, makes for a truly fascinating read. The heartwarming revelations about her personal and family life also made me admire her all the more. This is an odd question to be answering for an autobiography, but that said, if you enjoy memoirs and like getting up close and personal with the subject, this is a must read! Barbara's personal and professional story is incredible and very interesting. Aside from Barbara herself, her comments and personal views about all of the Presidents she has interviewed throughout her career were truly fascinating. The narrator is fabulous and adds to the poignancy of this memoir. Such a wonderful choice! I don't want to mention any particular anecdotes, as they will be spoilers for those of you that decide to get the book, however, I found the episodes of Barbara's personal and family life very touching. Not only do I admire all of her professional achievements as a television journalist, but I also appreciate them knowing the personal struggles she went through. Even if you've never been a Barbara Walters fan, you have to appreciate her career. I found this entire memoir to be captivating, interesting, enlightening and hard to 'put down'. The history alone of what Walters has accomplished is incredible. If you ARE a fan, you must purchase this and give it a listen. Great narration and wonderful storytelling. Barbara Walters has done SO much and with such a great attitude. She's changed the way women are viewed and treated in television. I really enjoyed this book. I'm not a very political person, so some of the foreign leader interviews weren't super interesting to me - but the way they were communicated were always with a personal focus which is something you don't usually get when watching a formal interview. I truly enjoyed this book. After reading this book, Barbara Walters has become one of my favorite celebrities. There are tidbits about so many famous people. I have always liked Barbara Walters and this book re-enforced my high opinion of her. I am also a big fan of the narrator. Do not let the 26 hours intimidate you...I hated to see it come to an end. Barbara is a good story teller and she has a lot of stories to tell! Wow! What an interesting life.